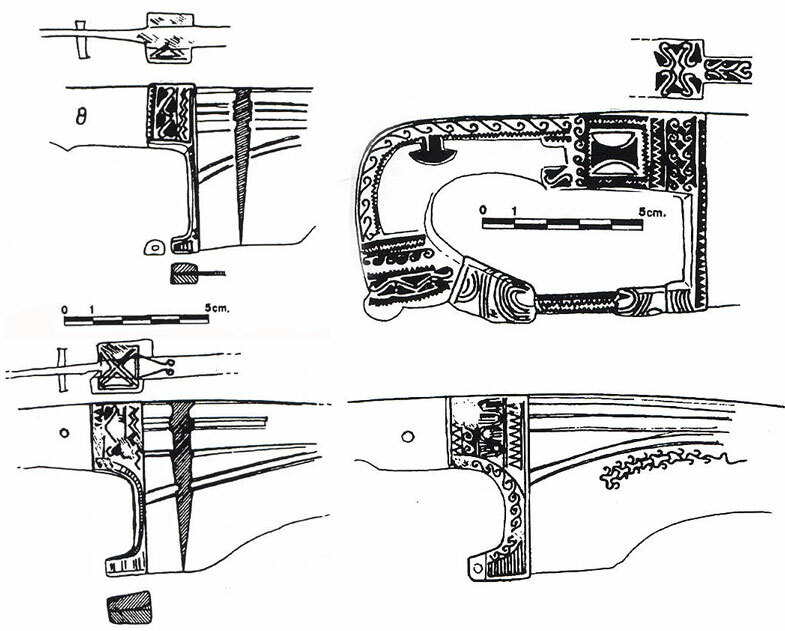 [This thread was inspired by the landmark work of Fernando Quesada Sanz entitled: “El armamento ibérico: Estudio tipológico,geográfico, funcional, social y simbólico de las armas en la cultura ibérica (siglos VI–I a.C. 2 vols.) As the title suggests F. Quesada Sanz illuminates the typology, geographical distribution, function, social and symbolic aspects of Iberian weapon systems within Iberian culture. It was the material on the Falcata that fascinated me. Because this important work is so difficult to find, I thought I would share a series of montages of some of the graphic information. 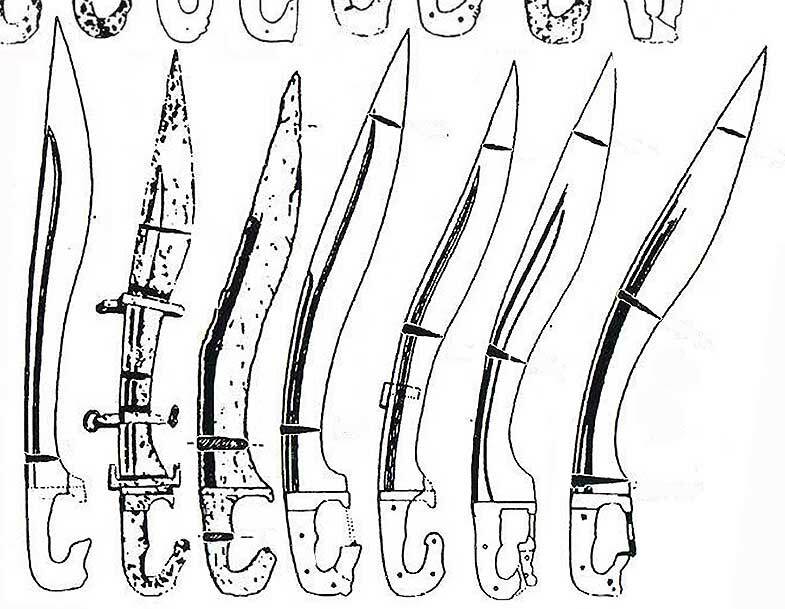 It is imperative that the reader not attempt to draw any conclusions whatsoever about the historical or forging traditions from the grouping of sword forms in these montages. They are mixtures of forms from many different discussions throughout the work. I have simply grouped them into a condensed form based on similar form to save space. 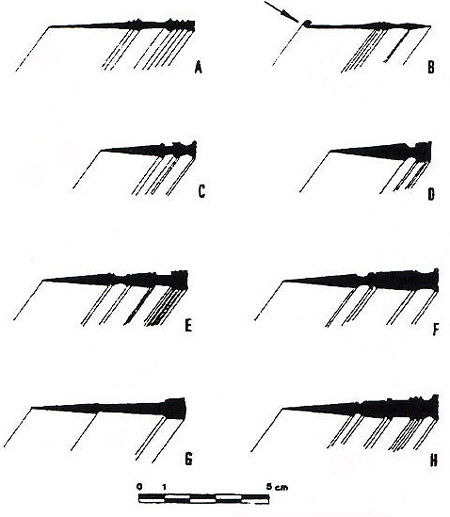 These groupings are not meant to convey any information other than the varieties of design. I encourage anyone who would like to understand the historical and geographical relationships to get access to this landmark work and examine the many fine figures within their context. It is appropriate that Alexander the Great would be associated with the Kopis, for it is believed that he is partly to blame for its popularity and wide distribution. 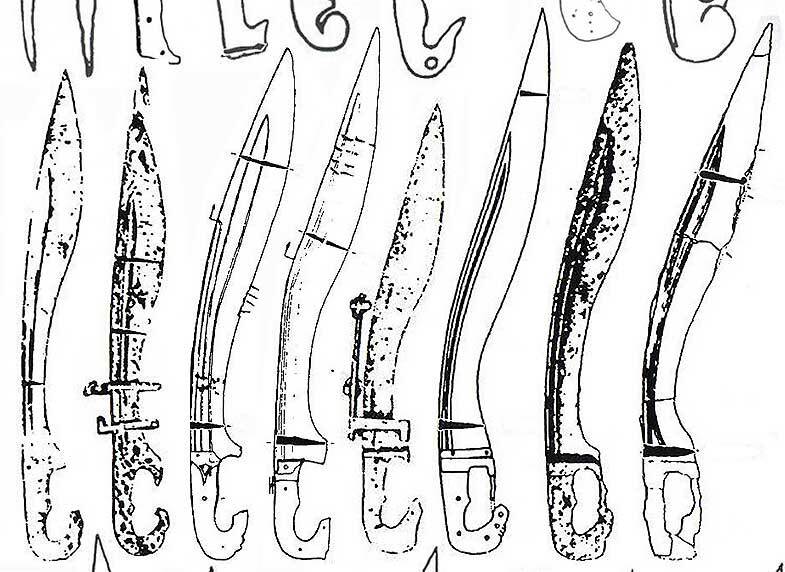 He carried the design into Turkey where it still survives as the Yataghan and even into India where it can still be seen in the Nepalese Kukri and Kora. 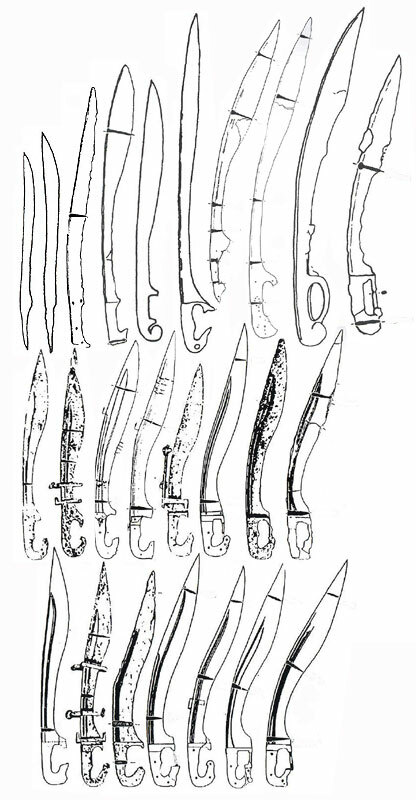 And, as the Hellenistic empires carried the Kopis into Spain it became known as the Falcata. It is in the in the hands of the Carthaginians that the Romans first encounter this Iberian helmet breaker. If you image a straight sword with a forward recurve edge on both sides you would not be far from the Gladius Hispanicus… It is a double-edged Falcata of sorts. 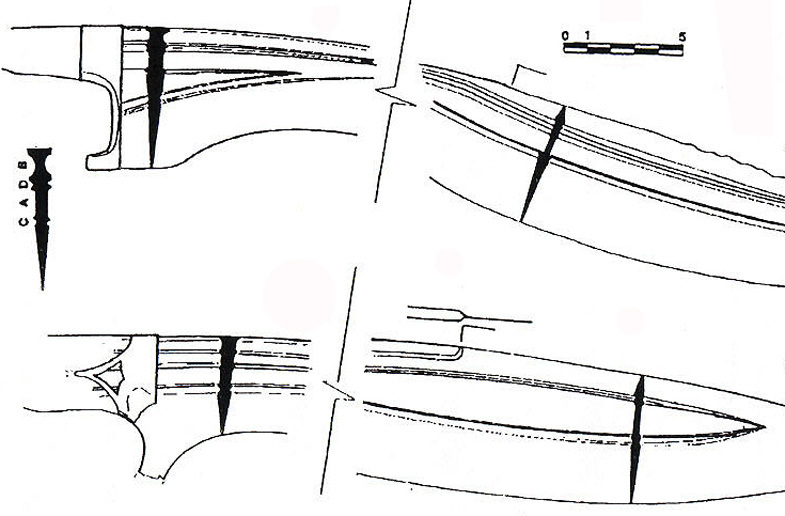 It is possible that this is the precursor to the Roman gladius… especially as seen in the Mainz pattern. Lastly... a couple of close up pics showing some nice inlay work and some blade sections showing fullering patterns. Thanks for the awesome pics, Kirk! I never knew about Alexander's role in making the kopis popular. remembered him when Europe had gone dozy after the Fifth Century C.E. Alexander legacy from deep in Asia Minor. For what it is worth, I lived in Egypt some years ago, and the Egyptian city we know as Alexandria is called Iskandariya in Arabic. So, very similar pronunciation. And in Turkey, there is a city called Iskenderun or Alexandretta. Kirk , I've never seen drawings of the cross-sectional properties of the Falcata. Do you happen, by chance, to have any information on the metalurgy or material usage for these weapons? 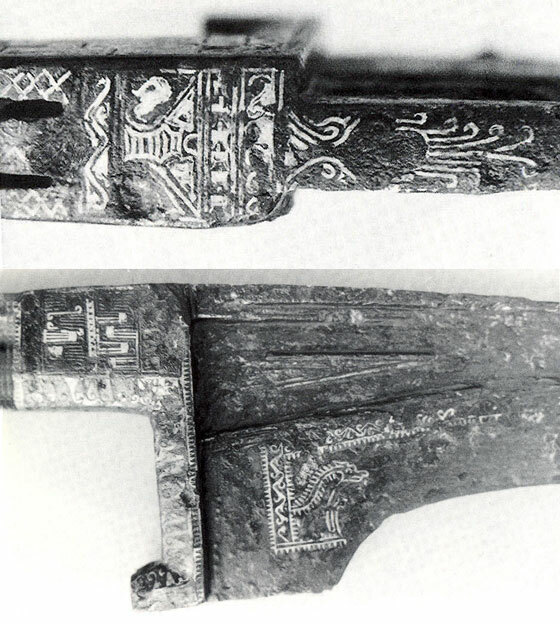 Many of those blade properties are super complex, and I'm starting to become very interested in the constructional aspects related to the making of this sword: both in terms of tooling and methodology. The falcata/kopis has always been a particular favorite of mine so this thread is greatly appreciated. 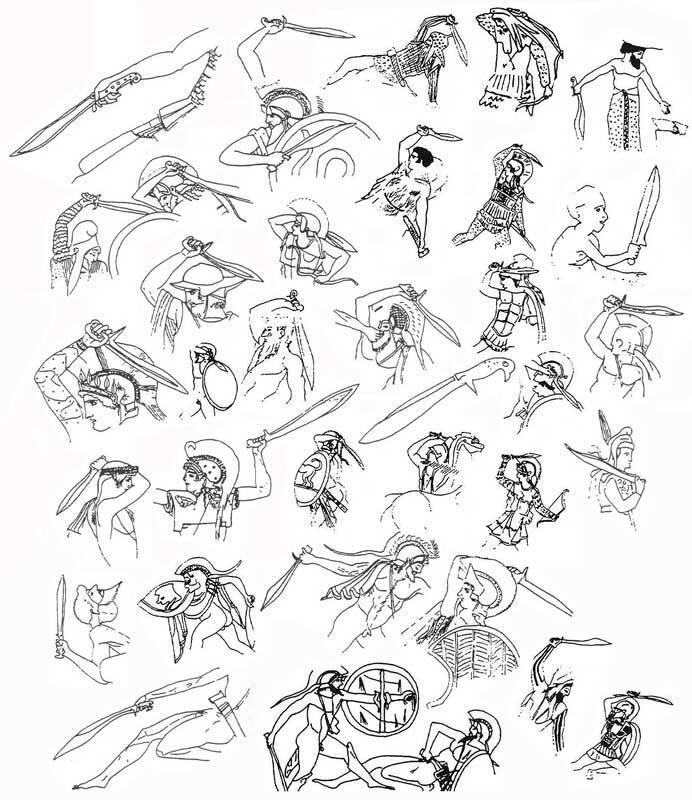 Did you get these illustrations from a particular book or did you do them yourself? Sorry it has taken me so long to respond... I have been at my grandmothers for Thanksgiving and she does not have a computer, much less the internet. The first illustration was something I worked up in photoshop from images taken from several sources. All the others are from “El Armamento Iberico” by Fernando Quesada Sanz. 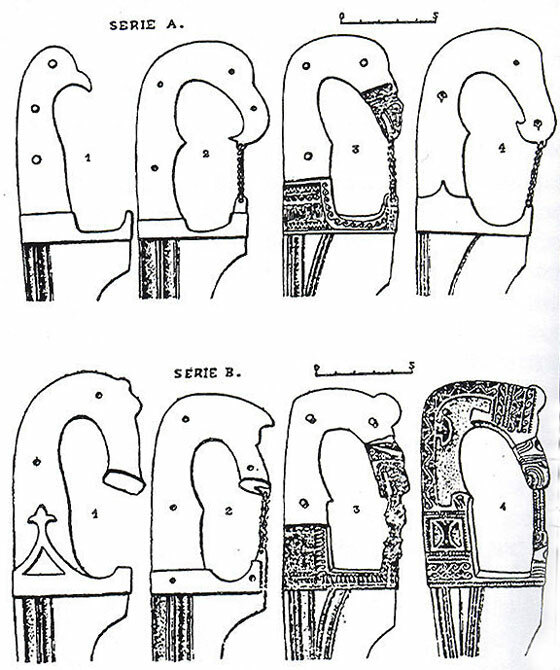 However every one (other than the chart of blade cross-sections) were combined from many plates and figures in the original work. 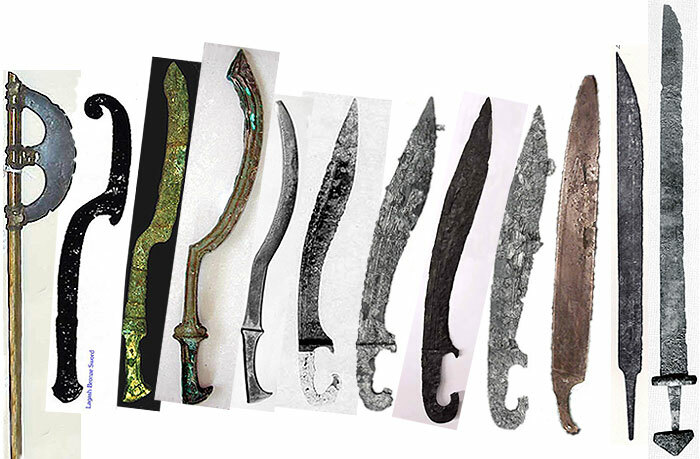 My primary reason for combining them was to see if I can recognize progressions in the blade geometries. It also helps that I can reduce the important subject matter of 20-30 figures and plates into 7 or 8. 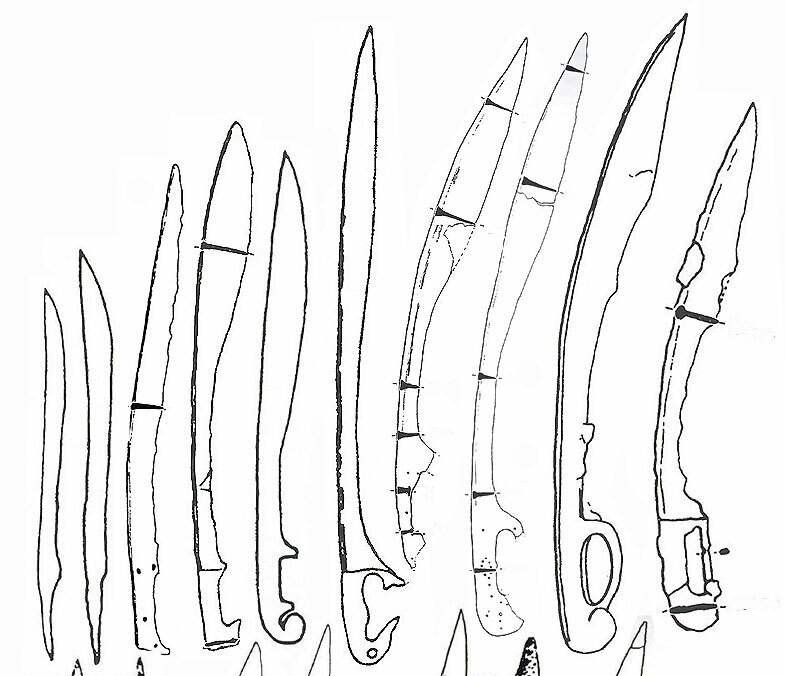 For instance the compilation of period depictions of the Falcata in use was taken from many figures in the original work and I even through in a few that I have collected from another source. The illustrations you put together are outstanding and very educational. I think Kirk's images might deserve a photo album of their own so that we can keep them as a permanent reference. 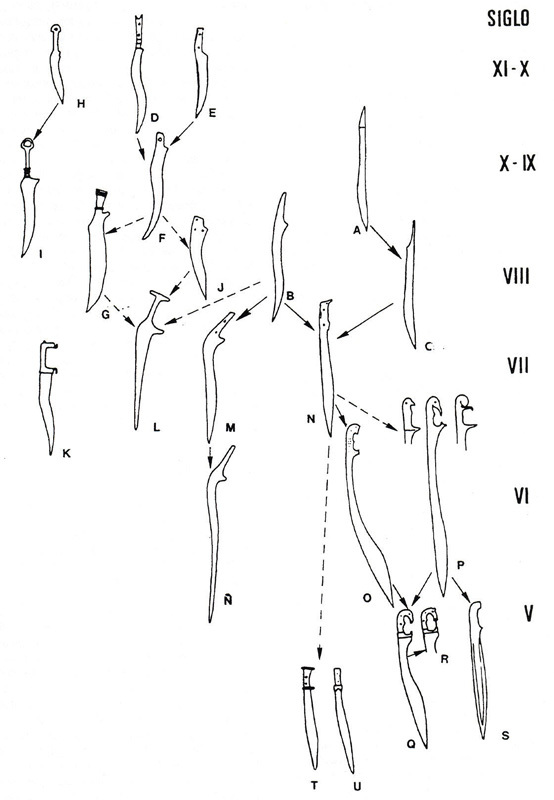 While it does not belong to my main area of interest, I have always been interested by the falcata, but I have never seen a work that shows that many varieties, or goes to that length to show their evolution. Thank you; these images have been very informative, and I second the idea of finding them a permanent place. I don't know a whole lot about these swords, so please keep that in mind when reading this question. While I think it's obvious that these types of blades are extremely adept at chopping and cutting, I'm curious about the ability for them in the thrust. It would seem to me that the shape of the blade, like a khukri, would put the tip in a very natural position for an easy thrust. In other words, while the shaping of the blade makes for a more efficient chopper, it would seem to me that it doesn't detract from the thrusting ability. Thoughts? I have a Coldsteel Khukri and it seems to me that keeping the wrist in a neutral position put the point almost strait forward and that a snap cut would make the point dig into a target. So although primarely a cutter the use of the point seems very usable. Thanks for the compliment guys... It would be an honor to do some more concentrated research and writing for the website. I have the MRL Falcata that is currently in their catalog (not the horse-head one that was offered about a year ago), and it is surprisingly comfortable to thrust with. The point on that falcata is not very sharp (in fact it is quite rounded), but there is enough distal taper in the last half to third of the blade that it will still penetrate against soft targets. 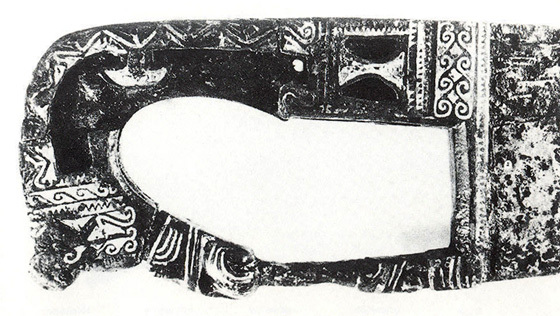 I find that the angle of the blade and grip is such that the hand is placed in a position similar to that used when shaking hands. Also, because of the blade's mass, there is quite a bit of inertia that carries the sword forward; the curved grip allows one to keep hold, but I did find that the curved surface wants to rotate around the hand a bit, resulting in the type of "snap cut" that Jean Thibodeau mentioned. I had to practice a bit before I was confident in my thrusts, but the short length aids control of a sword whose balance might otherwise hinder either attack or recovery. I found that the most natural thrusts were delivered with the arm straight or only slightly bent at my side. Thus the targeted area of your opponent would probably be in the abdominal region most of the time. I would not consider that to be an ideal circumstance, but it beats getting snuffed out by the other chap. Sometimes the line from The Mask of Zorro ("the pointy end goes in the other man") is sufficiently apt; why make things more complicated than they have to be? Because of the falcata's curved blade, I suppose that it would be reasonable for someone to suggest that it could be used for stabbing around shields. I personally would not recommend that practice, as the inertia created by the compact nature of the sword keeps it from rotating in mid-attack. Also, if such a maneuver were accomplished, much of the strength of the blow (aside from inertia) would come from the wrist. I do not consider the falcata a sword that can be used from the wrist, and to engage in such a maneuver would play havoc with any effort at recovery for defense or follow-up attack. So there you have my two cents. Predominatly a cutter, but I would not hesitate to use it in a thrust, given the proper opportunity. P.S. You guys are making me miss my swords even more.